Educators and staff who work in schools and districts are a busy group. When they're not keeping kids on track, communicating with parents or cultivating their own skills, somehow they're expected to stay on top of technology that can help them do all of those jobs better. With that in mind THE Journal offers its second-annual Readers' Choice Awards. We went out to our readership and requested their votes in numerous categories. People told us about their favorite products — from 3D printers to anti-virus to assessment and augmented reality headsets to student information systems to videoconferencing and wireless access points. This year's Readers' Choice drew 1,003 people to vote for their favorite products in more than 50 categories. The largest contingent (39 percent) was made up of teachers. Thirteen percent were school or district administrators or non-teaching staff. Another 11 percent were education specialists who held positions outside of teacher. Ten percent came specifically from the ranks of the IT organization. And the remaining 20 percent either were education consultants unaffiliated with vendors or fell into the category of "other." Two-thirds of participants work in a public institution or local education agency; 15 percent work in private schools; and 19 percent came from other environments, including outside of the United States. Respondents weren't required to vote in any given category. We left that to their individual discretion. The overall results offer a portrait of a changing landscape. Because we told respondents to vote only in those categories where they had real favorites, we could tell which ones also attract the most attention these days. No longer is K–12 focused on the hardware. While categories related to computing devices drew plenty of attention, the real rallies took place this year in the voting on software related to learning — reading, math, learning management and professional development. K–12 education is shifting away from delivering technology to keep the show running behind the scenes and placing new emphasis on main stage performances: engaging learners in innovative ways to improve student outcomes. When we asked people to name the most valuable technology for their school or district in an open-ended question, three names showed up in vote after vote: Lexia, Chromebooks and Edsby, in that order. As one of many fans reported, platinum winner Lexia's literacy program "is valuable mainly for the students, but it is incredible for the teachers. The teacher database is one of [a] kind. It allows the teacher the ability to pinpoint just what the student needs. The teacher is the 'miracle' worker of the program, and Lexia provides the necessary information to improve student achievement." Grabbing the gold this year was the Google Chromebook. As one enthusiast summed up, "Because of their affordability, ease of use and setup and integration with [Google G Suite for Education], these are ideal fits for our cash-strapped districts." Edsby, which took silver, earned this accolade from a respondent: "It continues to be the heart of our school community online. It has increased the voice of our students, centralized announcements, assignments and document resources and given staff a way to work differently together." We also asked readers in an open-ended question to share their three favorite technologies they currently use in their capacity as education professionals. We added those choices up, figured out which ones garnered the largest number of votes and ranked them by count. Two companies kept popping up: Apple, for its hardware, and Google, for its software. After those choices, people expressed their affection for interactive whiteboards, literacy education technology company Lexia, and, more broadly, having as many computing devices in the classroom as possible. Multiple companies were named that also showed up as winners in other categories — with two exceptions. Mimio Boxlight sells all products interactive — whiteboards, touch boards, projectors, flat panels, ink capture and software. Edsby offers an online learning management system with data reporting and analytics. The top prize goes to Lexia, whose Reading Core5 programs blend reading help with assessment in a game-like environment that runs on multiple student computing devices. Gold was claimed by Renaissance and its interactive reading software. Silver went to Houghton Mifflin Harcourt's Read 180 Universal, a blended application that helps students in grades 4 and up build reading comprehension, vocabulary and writing skills. Platinum in this category went to two education tech leaders, IXL, with its gamified math challenges, and Renaissance, with its "math practice adventures." Gold was claimed by DreamBox Learning, which delivers 2,300 standards-aligned lessons. Silver was earned by Houghton Mifflin Harcourt for its K-8 math classroom curriculum. Silver: Houghton Mifflin Harcourt GO Math! Discovery Education won platinum for its expansive combination of high-quality streaming media and interactive science textbooks, otherwise known as "techbooks." Delta Ed's FOSS won gold by building up a fan base for its project-based approach to science that adheres to the Next Generation Science Standards. Hands-down, the favorite source for education-oriented robotics was Lego, which offers the middle school-oriented Mindstorms line, with bundles and curriculum for teaching science, technology, computer science and math. Vex Robotics took gold for its combination of robotics kits and student competitions. Wonder Workshop emphasizes first-time robotics that teach the basics of coding. When educators consider their best options for teaching coding to students, what comes to mind more than anything else is platinum winner Code.org, a non-profit that promotes an annual Hour of Code to encourage every teacher and every student to take up the practice. Gold goes to Tynker, which delivers self-paced programming lessons and curriculum for the classroom. Some online programs do an excellent job of stealth assessments that students don't even notice but still help teachers figure out what should be next for instruction. At that top of that list, earning platinum, is Renaissance with its Star 360 reading and math platforms. Close on its heels, taking gold, is Kahoot!, which helps the teacher create games that get kids jazzed about learning. Achieving silver in this category are two companies: Houghton Mifflin Harcourt, whose GO Math! offers functionality to let teachers create formative and summative assessments; and NWEA, a not-for-profit with a well earned reputation for building solid adaptive assessments, such as Measures of Academic Progress (MAP). Two of the same companies that won medals in the last category dominate in this one too. Renaissance grabbed platinum. And NWEA took gold with MAP. Google Classroom, the top reader choice for LMS this year, is the same online service that won platinum last year. Described by the company as "mission control for class," the application helps teachers create classes, distribute assignments, collect homework and deliver feedback. Perhaps most importantly, it's free with Google G Suite for Education. A new addition to the list, Schoology received gold this year for its attractive combination of LMS and assessment capabilities. This is the second year that silver winner Edmodo made it to the podium, with its emphasis on connections and collaborations among teachers, students and families. When it comes to honing skills, educators have a lot of places they can turn for online connections and lessons. The most popular places among THE Journal readers are quite different environments. The Discovery Educator Community hosts online and in-person events, delivers teaching resources and shares community stories; Twitter is a place where people congregate for rapid-fire chats on specific topics and "follow" others in the community who may share their sensibilities and interests. Both of those won platinum this year. Gold winner LinkedIn adds a career-oriented touch by allowing participants to build a professional profile and maintain connections with others in the same or related fields, read articles posted by members and hear about new opportunities in research and professional development. Silver winners simpleK12 and Teaching Channel both offer a broad collection of online training specifically for teachers. If the shopping suggestions offered up by Amazon amaze you with their uncanny connections to what you care about, imagine the same technology being applied to a student struggling to understand a new concept. The best adaptive and personalized learning tools do just that. Lexia took platinum in this category with its Reading Core5 product, winning nearly a quarter of all votes. Renaissance secured gold for its reading and math programs. Silver was a three-way tie between Edgenuity, Read 180 and Scientific Learning Reading Assistant, all of which aspire to apply data to deliver just the right learning experience to the student at the moment it's needed. Whereas adaptive software works for every student, a slightly different category helps identify students who are struggling and may be going off track in order to bring them back onto course. Each of the winners in this year's ranking address reading and/or writing. Platinum winner Renaissance, which is showing up a lot this year in the awards, won for its early literacy assessment program. Gold was a tie between Achieve3000, which customizes its reading and writing instruction to each student's Lexile reading level, and Scientific Learning's Fast ForWord, which uses brain science to create software for reading intervention. Silver winner Read Naturally focuses its many programs and tools on helping struggling readers achieve fluency. The best ePortfolio, according to our readers, is usually the same one built into the learning management system already in use. Perhaps that explains why three of the same LMS companies that took medals last year also appeared on the leaderboard this year. Blackboard Learn achieved platinum after winning gold in 2015. Open source, community-supported Moodle snared gold. And Instructure Canvas collected silver, alongside Seesaw, a dedicated ePortfolio product. The latter program allows students to document what they're learning through photos and videos and then share it. Some education products defy common categories, so we've added a catch-all "other" vote for just that type of offering. Khan Academy is the perfect choice for attaining platinum this year, because this video-packed website with student and educator tools could be used by every teacher in the land for one reason or another. Discovery Education tied with itself for silver; readers loved its Streaming Plus education video service as well as its interactive "techbooks," particularly for science. Learning.com helps schools address the transformation away from paper-based lessons and towards student use of technology and digital content, with an emphasis on developing digital literacy. It used to be that "student response" referred to classroom clickers where the kids could answer questions posed by the teacher to keep their attention up. Nowadays that's just one way to do the job. Kahoot, platinum winner, helps educators add gaming components to their lessons. Socrative, gold winner, delivers a passel of tools for managing classes, assigning work, creating on-the-fly quizzes and adding gaming into digital activities. Smart response 2, silver winner, fits the traditional definition of student response by allowing the teacher to create a question set that students can answer on their various computing devices. When teachers want to get together in or out of the classroom or want their students to do the same, they have a bunch of choices. Standing at the top of the podium this year, with 70 percent of the vote, is Google with its many collaboration tools, including Hangouts, Classroom and G Suite for Education. Microsoft also has its many fans, taking gold for Skype, Office 365 Education and Classroom. Nearpod, accomplishing silver, is the new kid here, with an online service that allows teachers to create or download multimedia presentations that they can share with their students for interaction, response and assessment purposes. Classroom management goes far beyond keeping kids stapled to their seats and listening. This year's platinum victor, ClassDojo, is a free app that helps teachers create a positive culture and then share those experiences with parents and that helps students record examples of their great work. PBIS, gold champion, is an online repository where the U.S. Department of Education's Office of Special Education Programs makes its many tools available to schools and districts that want to transform how students and staff treat themselves, each other and school personnel. Silver winner Google Cast is better known for letting people broadcast their favorite shows from their small screens to their large screens. The education version does something similar by allowing teachers and students to share their screens wirelessly. As data comes to the forefront as a powerful tool for improving each child's educational experience, the student information system is the most obvious place to start that use. PowerSchool earned platinum in this category for growing into a powerful suite of applications for managing school processes, including learning in the classroom, handling assessments and providing analytics and reporting. Skyward attained gold with its extensive collection of school and classroom programs for handling everything from attendance to test bank management. Silver winner Infinite Campus combines SIS and enterprise resource operations in one integrated product. As the flipped classroom goes mainstream, educators have a lot of choice when considering how to record their lectures or presentations. This year's platinum winner, Screencast-O-Matic, offers a free version that lets the user make 15-minute recordings with from the screen and the webcam and saved as a video file or posted to YouTube. (The $15/year version covers longer recordings, includes editing tools and lets the user publish to additional places.) TechSmith drew both gold and silver with its basic and high-end products. Snagit grabs perfect screenshots (even for scrolling screens) and allows for quick, one-take videos. Camtasia provides video editing, animations and special effects for users who want more complete control over their videos. Document cameras have grown way beyond their initial purpose of sharing notes or zooming in on a specimen. Now they can display content from the instructor's device, record presentations for later viewing and provide microscope-caliber images for up-close examination. Last year's gold winner, Elmo, collected platinum this year. AVer, which has multiple kinds of document cameras, picked up gold. And Smart, whose document camera integrates with its interactive whiteboards, achieved silver. In this category the ranking was exactly the same this year as last year. And once again, one name stood considerably taller than the rest. Epson earned platinum with its education-friendly pricing and broad array of projector types — interactive, 3D, short-throw, large room and ultra-portable. For the same reasons, Hitachi secured gold, and InFocus won silver. As was true with the previous category, this one also perfectly matches last year's results. Even as projection technology is merging and expanding, the votes mostly went to platinum winner Smart Technologies, which long ago outgrew its interactive whiteboard roots to produce interactive displays, learning software and dry-erase whiteboards whose contents can be saved and shared. Promethean took gold with its popular collection of interactive whiteboards, walls and tables. Epson, silver winner, doesn't offer a whiteboard per se; but then again, with its interactive projector technology BrightLink in place, who needs one? Online sessions are no longer exclusive to distance learning. Now the school community may choose to get together online for all kinds of reasons: "bad weather" days, team meetings and district-wide events. Google Hangouts, the platinum winner, is part of Google G Suite for Education. That version, which is free, can accommodate up to 10 participants; the "work" edition can handle up to 25 people. Gold winner Microsoft Skype takes classes on virtual field trips, makes lessons with experts available and offers "Mystery Skype" to bring classes from around the world together. Web conferencing pioneer and silver winner WebEx continues to supply reliable video and audio connectivity for any size of group. This category and the previous one share functional boundaries. Two web conferencing winners also appear here: Google Hangouts for platinum and Skype in the Classroom for silver. Citrix's GoToMeeting acquired gold in a competitive field with two dozen contenders. Few would question the need for audio technology in a college classroom. So we're a bit boggled by how few K-12 classrooms provide the same gear. After all, audio and sound enhancement products can help the teacher preserve his or her voice when classroom interactivity is at its loudest (and most rewarding) level. Three of four winners showed up in last year's tally, although in different orders. First comes Lightspeed Technologies in platinum position with its multimedia hub for amplifying audio. Smart, succeeding with gold, offers a couple of classroom amplification systems that integrate with its interactive whiteboards. Silver was a tie between Califone, which specializes in the "sounds of education," and FrontRow, which accommodates all kinds of important sound in the school building: intercoms, paging bells, mass notification, classroom audio, lesson sharing and audiovisual controls. Kahoot, which took a medal in the category dedicated to student response, also wins platinum in the gaming category with its easy-to-use platform for creating games. Gold winner Minecraft has long entranced kids with its immersive worlds that, depending on what kind of day the students are having, can be explored, built up or blown up. Although an argument could be made that Assassin's Creed offers lessons in history and League of Legends teaches teamwork, those games won't find a place in the classroom anytime soon. However, Minecraft has long had a home in K-12, as readers pointed out by voting it into the platinum position. Nothing else came close. Apple's mobile device operating system, iOS, snared a third of the votes in this category to claim platinum. The games that play on the iPad or the iPhone are inexpensive and engaging, and most students feel like they're getting a real treat. Gold went to the Sony PlayStation and the Windows Xbox, which require more investment, but nobody can deny just how immersive gaming environments can be when they're fed from these consoles. Windows' gaming capabilities triumphed for silver, whether the hardware is a Surface, a PC or a phone. As educators figure out how to use VR and AR to bring a lesson to life by immersing students in new places and experiences, Google Cardboard, which won platinum, has become the favored method of delivery. It's inexpensive and simple to operate. Up a big step is Samsung's Gear VR, which collected gold for its Oculus-powered headset. And silver was a tie between Facebook's Oculus Rift and Sony PlayStation VR. Of course, without something to explore, those VR/AR winners in the previous category are really just clunky headbands. Only one company's augmented reality platform emerged as a true victor. Platinum winner HP Aurasma is a smartphone app that allows users to blend their real world with interactive content or "auras," such as videos and animations. With a bit of rank shuffling this category features the same products as the 2015 winner's list. Grabbing platinum for two years running is Microsoft PowerPoint, a true classic for presentation work built into Office and Office 365 Education. Gold this year went to Google Slides, built into Google G Suite for Education. Attaining silver is Prezi, the online slidesharing program that offers a free plan for education users. This year's rundown for best productivity suite exactly mirrors last year's. Winning almost half of the votes, Microsoft Office and Office 365 Education achieved gold. Second on the podium was Google G Suite for Education. Third for silver was Apple with its Productivity Apps. This category too replicates last year's two winners. Accomplishing platinum for the second year in a row was Adobe Creative Cloud with its robust collection of downloadable visual tools and education pricing. A favorite among Mac and iOS fans, Apple creativity apps attained gold with its mix of productivity apps and Photos, iMovie and GarageBand, available free for Macs and iPads. For creating classroom content, two-thirds of teachers turn to the programs inside Google G Suite for Education, according to our vote, giving it platinum. Vying for gold in a tie were two very different kinds of products. iBooks is specifically intended for Mac users to create interactive texts for redistribution. Adobe's Creative Cloud includes a mass of tools for building websites, cool visuals and other captivating output. Who makes the best media tablet for the classroom? Wooing seven in 10 votes, Apple's masterful iPad, with its potential to run 1.5 million apps, zoomed to the top of the list to take platinum. Google Android-outfitted tablets claimed gold. And Samsung, a winner last year as well, claimed silver with a wide mix of Tabs and Views. Chromebooks rock for quick boot-up, fast access to free productivity tools and lightweight form factors — perfect in K-12. The favored makers are HP, which won platinum this year; Dell, for gold; and Lenovo for silver. It would make sense that platinum would be earned by the company that understands Windows better than anybody else. And thus Microsoft with its Surface line of tablets topped the list. Dell, HP and Samsung, which all offer Windows operating systems on some of their tablet models, accomplished gold. And Lenovo won silver with its ThinkPad tablet designed for education. Two-in-ones serve multiple functions; students can be productive in laptop mode, creative in tablet mode and on the move with foldback mode. Two companies won platinum medals for supplying convertibles to educators: HP and Lenovo. Dell's inexpensive Inspiron line and pricier XP line succeeded in taking gold. Asus Transformers collected silver. The same roster of winners that swept this category last year did the same this year, albeit with new models across the board and one new vendor squeezing onto the podium. First came Apple with more than half the votes for its MacBook and MacBook Pro machines. Dell tied with HP in winning gold with numerous lines of laptops; for Dell that covered the Latitude, Inspiron, XPS and Mobile Workstations. For HP the popular models include the "Education Edition" laptops. Lenovo obtained silver for the second year running with several configurations of notebooks. To simplify the process of keeping computers up to date and to extend the life of older hardware, schools and districts have turned to virtual desktops and thin clients to keep their computer labs humming. VMware, a new addition to this year's winner's circle, took platinum with its Horizon solution. Lenovo's ThinkCentre line drew the votes to give it gold billing. Dell Wyse accomplished silver with its hardware and software components for delivering virtualization. While platinum victor Cisco and gold champion Netgear appeared in last year's ranking in the same positions, two new winners — Aerohive Networks and HP Aruba Networks — vied for silver this year. All of these winners offer help with E-rate planning and have deep experience in working with schools and districts. In spite of all the froth and foam over the past two years in the 3D printing business, one company rises above all others. Long-time 3D printer maker MakerBot, a division of 3D printer pioneer Stratasys, won gold for its relatively inexpensive printers and many education resources. 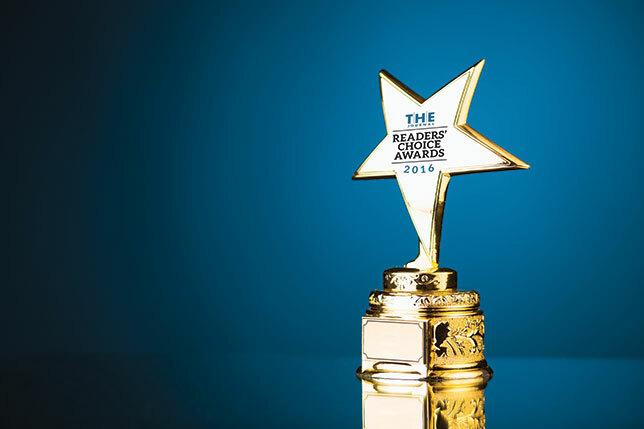 This new addition to the Readers' Choice offered more than three dozen products to vote for, but two familiar names took the medals: Microsoft with its comprehensive System Center for platinum and Cisco for gold. Both work well in the data center that uses the technologies and applications offered by the respective companies, whether those systems are on premise or in the cloud. Google Mobile Management was the surprise winner in this category, a startling win for a company that only entered the MDM space a year and a half ago. Google Apps for Work administrators can manage Android and Apple iOS mobile devices as well as Microsoft Windows phones, smartphones and tablets that use Exchange ActiveSync. AT&T's gold prize goes for a solution with multiple suites to cover mobile devices, mobile content and application management, with AirWatch-hosted MDM at its core. Giving students a way to report anonymously on the activities going on in the hallways and after school can make the difference between building a school culture that teaches how to look the other way when bad stuff happens or one that shows kids how to tackle complex problems in a thoughtful, safe way. Platinum was claimed by MySafeSchool. Gold was taken by CyberBully Hotline. Both solutions have found fans in K-12 by providing simple reporting tools for use by students and effective workflows for follow-up work by the adults. Whether it's an intruder on campus, a bad weather alert or a case of head lice in the classroom, parents expect schools to communicate with them through the mechanisms they like to use. Platinum leader School Messenger and gold winner Blackboard Connect both give users a platform that unifies their messaging from a single console and accommodates multi-modal delivery. Choosing a firewall these days is akin to picking out what level of carwash you want. Do you go for the underbody treatment with the deluxe package or stick with the overall clear coat that every deal includes? Do you choose the program that prevents unauthorized people from turning on your webcam or do you stick with the basics — keeping your machine safe from baddies like viruses, spyware and malware? In this voting, readers chose Kaspersky, lifting it into platinum position with a comprehensive set of security solutions. Close behind, winning gold, was Norton 360. And claiming silver was Windows Firewall, built into every copy of Microsoft's operating system. In this category Cisco achieved platinum with a quarter of the votes for its FirePOWER line of appliances. Although McAfee secured gold for its NextGen series, earlier this year that business was acquired by Forcepoint, which said it would bolster its own Stonesoft next-generation firewall with the addition of McAfee's security experts. Platinum winner McAfee, which was recently peeled off of Intel Security to become its own corporate entity, blocks viruses, ransomware and malware and handles other chores, such as "shredding" sensitive digital files. Gold winner Microsoft has the advantage of building its AV tools right into the operating system and delivering it free from there. Silver turned out to be a tie between Avast, with its free PC/Mac/Android/iOS antivirus, and Norton AntiVirus from Symantec, which provides basic functionality to stop viruses and spyware for safe online activities. As classrooms evolve to become hotbeds of projects, inquiries and problem-solving (was it ever not that? ), teachers have discovered that students do better when they have room to move around. Long gone are tiny matrices of chair-desk combinations. Mobility rules. In this new category Steelcase captured platinum with its education line of chairs, tables and planning resources. Bretford, claiming gold, offers a similar line of products and adds on carts for computers and tablets. Childcraft, a division of School Specialty that took silver, emphasizes early childhood learning and toxic-free furnishings and toys.